Your toilet is one of the most important parts of your bathroom. It’s certainly the most frequently used! Each year, we flush thousands of gallons of water down our toilets, and for the most part, they work fine. Toilets are fairly simple in nature, and they tend to last for several years without causing any major problems. Sometimes, however, problems do arise, and even when they don’t, you may decide you’d like to upgrade to a more efficient or newer model. At Petri Plumbing, we offer professional toilet replacement in Brooklyn and the surrounding areas. From helping you choose the model that’s right for your home to professionally installing it, our friendly technicians do it all. It’s broken. Whether it’s not flushing properly or the bowl or tank is cracked, replacing it is likely your best option. It’s several years old. Older toilets use significantly more water than newer models. Upgrading to a low-flow model could save you big on your water bill and minimize your impact on the environment. It’s not comfortable. Is your toilet too high, too low or just generally uncomfortable? You may want to upgrade to a new one that’s a better fit for you. It doesn’t match. An old avocado green toilet in an otherwise updated bathroom sticks out like a sore thumb. If you have an ugly toilet that just doesn’t fit it, replace it for an instant bathroom facelift. At Petri Plumbing, we’re here for all of your Brooklyn toilet replacement needs. Whether you’re having a problem and need a new toilet as quickly as possible or you’re looking to make an upgrade for cosmetic or environmental purposes, we can help! 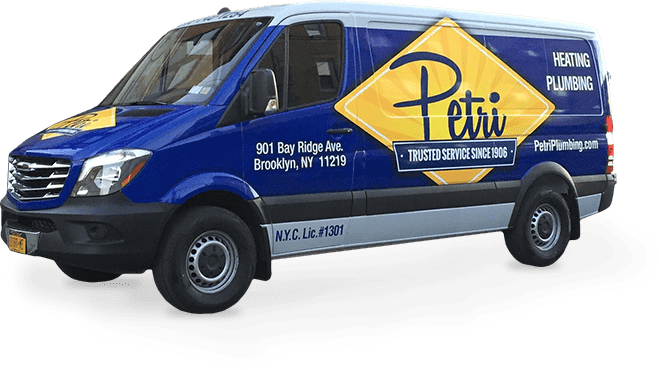 For toilet replacement in Brooklyn and the surrounding communities, contact Petri Plumbing today by calling 718-748-1254.